In this week's Abundance Insider: Self-charging stretchable ‘skins,’ virtual reality department stores, and real-time in-ear language translation. What it is: Otto is a startup founded by ex-Google employees that has created a kit enabling companies to retrofit a commercial truck into a self-driving car. In tests, Otto's sensor-laden hardware and OS transformed a Volvo VNL 780 into a self-driving truck; the team's next step is to work with Class 8 trucks. Why it's important: Otto's kits let companies create their own self-driving fleets without replacing every single vehicle. While this solution won't replace drivers entirely -- currently, a human still needs to be in the vehicle -- it will hopefully provide long-haul human drivers the critical backup they need for safer, more efficient drives. What it is: Ebay and Myer have partnered on what they're calling the first virtual reality department store. After donning the VR headset of your choice -- for this launch, the companies gave away branded Google Cardboard headsets called "Shopticals" -- users can browse over 12,500 Myer products. To avoid overwhelm, eBay's Sight Search technology learns your preferences and enables you to "create a unique shopping experience, picking only from categories of products [you're] interested in." Why it's important: Peter's written about the future of retail before, and this VR department store is a promising glimpse into our (ever-nearer) future of personalized virtual shopping. What it is: An international team of researchers led by the University of Illinois' John Rogers has developed a flexible solar-powered battery that could revolutionize the wearables industry. The array contains tiny, thin tiles made of solar cells, chips and biometric sensors, and it can stretch up to 30 percent larger than its original size without losing functionality. Why it's important: When we don't have to constantly plug wearables into power, these wearables become far more versatile and useful. Imagine putting on a "smart" workout shirt that can measure a wide variety of biometric data to share -- and generate its own power while you run outside. Or perhaps a set of biometric sensors that you can apply directly to your skin like a bandage, or even an outdoor jacket that can charge your devices as you walk to work. What it is: IBM has just achieved a breakthrough in optical storage, and specifically in phase-change memory, or PCM. This crystal-based storage isn't new -- we've seen it in tech like optical disks for almost two decades -- but IBM's researchers have now found a way to save 3 bits of data per cell. By doing this, PCM becomes much cheaper than DRAM, and much closer to the price of flash memory. Why it's important: IBM says that the breakthrough "...provides fast and easy storage to capture the exponential growth of data from mobile devices and the Internet of Things." It will enable faster machine learning algorithms and online query processing; when combined with flash storage in, say, a mobile phone, it would enable the phone to boot up in seconds. What it is: Waverly Labs' Pilot is a set of earpieces that performs real-time translation for users speaking different languages. Each person inserts a Pilot into their ear, and an accompanying app translates what you hear and feeds the message to your ear in your native language. At launch, Pilot will support English, Spanish, French and Italian, with plans to launch East Asian, African, Hindi, Arabic, Semitic and Slavic "soon after." Why it's important: Who are your customers, clients and business partners when there truly are no language barriers? How might instant, accurate and discreet translation influence where and how we conduct business? Powerful implications indeed. What it is: University of New South Wales engineers have developed a new solar cell configuration that converts sunlight into electricity at an efficiency of 34.5 percent -- a new world record that, according to UNSW, "nudg[es] closer to the theoretical limits for such a device." It's almost 44 percent better than the previous record, and was confirmed by the U.S. National Renewable Energy Laboratory. Why it's important: More efficient solar cells lowers the initial cost of investment while accelerating the return on investment. What's even better: we haven't hit the theoretical limit of photovoltaic cells, so this growth will continue. What it is: UCLA scientists have created a device that images cancer cells (without destroying them) and identifies 16 physical characteristics. It's comprised of a photonic time stretch microscope and a deep learning computer program that can analyze 36 million images per second and spot cancer cells with 95 percent accuracy. Why it's important: According to a UCLA press release, the researchers believe their system could "...lead to data-driven diagnoses by cells' physical characteristics, which could allow quicker and earlier diagnoses of cancer, for example, and better understanding of the tumor-specific gene expression in cells, which could facilitate new treatments for disease." What it is: India's space agency has just successfully launched and recovered a seven-meter-long prototype reusable space vehicle called RLV-TD. It's part of a five-year reusable shuttle project that Engadget reports is "believed to cost as little as $14 million." In 2014, India's space agency put a satellite around Mars for an impressively frugal $72 million. Why it's important: Innovation doesn't just come from traditional sources, and getting into space doesn't have to be costly. Engadget notes that a key enabling factor for India's successful yet frugal space program is that its team studies other countries' space missions rather than launching all their own experiments -- identifying past errors made and inventing shortcuts along the way. What it is: Here's another big win for artificial intelligence, courtesy of the Australian National University. Physicists recently used AI to replicate the exact experiment that won the 2011 Nobel Prize: creating a Bose-Einstein condensate by trapping a cold gas in a laser beam. "I didn't expect the machine could learn to do the experiment itself, from scratch, in under an hour," said co-lead researcher Paul Wigley from the ANU Research School of Physics and Engineering. "A simple computer program would have taken longer than the age of the universe to run through all the combinations and work this out." Why it's important: In this article, the researchers explain some of their most surprising observations, and in these, we see the true power of AI to advance mankind. For starters, the AI system made decisions "a person wouldn't guess" to replicate the experiment, which means it may be able to conduct tests in complicated ways that humans haven't (or simply can't). What it is: University of Virginia School of Medicine researchers have discovered a veritable fountain of youth called Oct4. Despite previous theories that Oct4 is inactive in adults, KurzweilAI reports that the researchers found Oct4 actually plays a key part in preventing ruptured atherosclerotic plaques inside blood vessels, and may also be able to help heal wounds and repair cell damage. Why it's important: "Finding a way to reactivate this pathway may have profound implications for health and aging," said researcher Gary K. Owens, director of UVA's Robert M. Berne Cardiovascular Research Center. 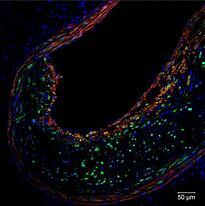 "This could impact many human diseases and the field of regenerative medicine. [It may also] end up being the 'fountain-of-youth gene,' a way to revitalize old and worn-out cells."